Manchester City’s primary midfield target Frenkie de Jong has chosen to join Barcelona and struck an agreement with the club, Catalan newspaper SPORT claims. Barcelona had long been favourites to land De Jong, but there were signs that City had moved into pole position following claims that Txiki Begiristain had made progress on a deal. However, according to SPORT, the 21-year-old Ajax star has now agreed personal terms with Barcelona and has one foot in the Camp Nou door. Half of the work is done for the La Liga champions, as they must now agree a fee with Ajax. 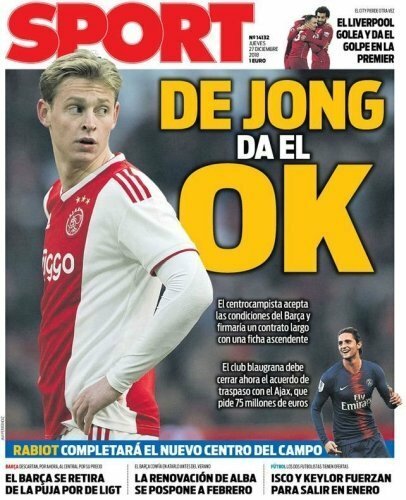 Ajax want €75 million for De Jong, a figure Barcelona consider to be excessive, and they plan to play on Frenkie’s wish to join them in order to lower it to around €60 million. It’s claimed that De Jong met with Manchester City, Paris Saint-Germain and Bayern Munich, listening to their offers, before deciding on Barcelona. Those clubs are reported to have ‘thrown in the towel’ and can now only hope for a breakdown in negotiations between Barça and Ajax. If true – and anything from the Catalan media does have a heavy Barcelona bias – then City will need to consider other options for the No. 6 role, one which they heavily rely on Fernandinho to occupy and lack suitable alternatives. The likes of Ruben Neves (Wolves), Allan (Napoli), Tanguy Ndombele (Lyon) and Houssem Aouar (Lyon) have all been linked recently, and it seems nailed on that Guardiola will recruit a long-term successor to Fernandinho in the summer transfer window, having ruled out any major activity in January.